Sports are considered as integral to all-round development of one's personality. Making an international mark in the field of sports also has a great bearing on national morale and prestige. In order to meet the increasing demands of the changing times, at national level, Asha Deep Foundation has taken upon itself to implement programmes to promote excellence in sports. The organization implemented the project Sports for Development to conduct sports for development activities among the underprivileged children of the community. The main purpose of the programme is to empower children and youth with positive experiences to enable them to discover and develop through sports. The goals of the project include sensitizing and advocating the Child’s Right to play, promoting gender equality, developing personal and social skills and bringing communities together through sporting opportunities by giving exposure to excellence and fair play. The programme is designed to encourage self-confidence, self-efficacy, communication, health and hygiene, civic sense, decision –making and conflict resolution skills in children and youth. The organization provides coaching to the children in Cricket, Football, Kabaddi, Kho-Kho, Athletic etc. Inter School and Inter Department Matches are held during the month of February. 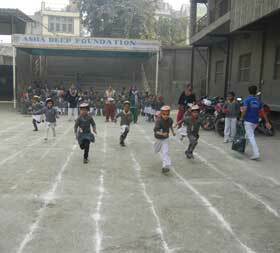 Every year in the month of February Asha Deep Foundation conducts Sports Day in the campus where more than 1500 youth and children present and view the event. The event starts with lighting the Torch, March past, races, different kind of drills, aerobic etc. are performed by the children. Prize and certificates to all the winners of the sports are provided through the Chief Guests/ Guests from the Sports authority of India. The winning Cricket/ Football team get Trophies and cups and it is one of the long waited thrilling/exciting times for all the youth /children. Children are regularly getting opportunities to have volunteers from different countries like Barcelona, Japan, USA to coach them on Football and other games. The children also get opportunity to watch International Matches like cricket, football etc. in the stadium in Delhi. The organization also organizes Sports activities in the rural villages of Ghaziabad, Uttar Pradesh. The youth and children enhance the spirit of learning through physical activities and games. These sports activities have been a great motivator for the youth and children to channelize their mind towards constructive and positive development. The sports for development are a medium to enhance the village participation and promote Sports like Kabaddi, Cricket, Football, Volleyball, Basketball etc. The youth of the villages become the mentors to the village children. The sports for development helped the rural youth to get employment opportunities in Government and Private Sectors.